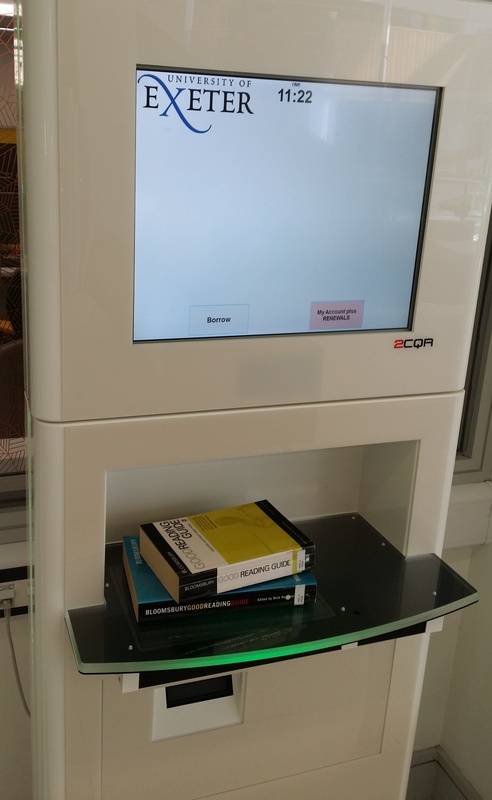 The British Library have recently launched a new improved service for delivering journal articles and book chapters electronically. We’ll be adopting it from 1st September 2015. 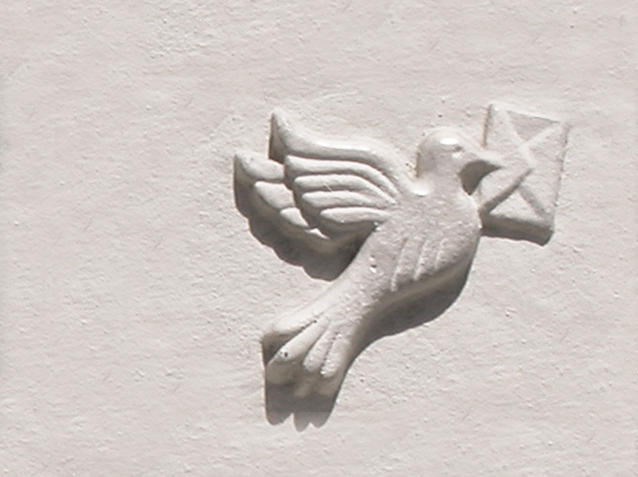 We’re already used to fulfilling your Document Supply (inter-library loan) requests electronically as much as possible. Electronic supply allows for much faster delivery, which we know is important when it comes to getting you the materials you need for your research. Currently, in order to download inter-library loans you need to install the File Open plugin on your computer. This software ensures all requests are compliant with copyright law and locks the article so it can only be viewed on one machine. Although it serves its purpose, the process of installing this software can be fiddly, especially on shared machines, so – like many other institutions -we’ve been asking for an easier and less restrictive option for some time. And now The British Library have unveiled one. From 1st September 2015 we’ll be delivering article and chapter requests to you via The British Library’s Open On Demand service, DRM-lite. How do I get articles via Open On Demand? The process of requesting an inter-library loan is exactly the same as before. Requests cost £13.50 or one token and should be made via our online order form. Before you can view your article you will need to have registered for an On Demand account with The British Library. Registering is free, just takes a few minutes and will only need to be done the first time. Once your account is set up you can use your username and password to access all the articles that have been supplied to you. If you are likely to be making use of our Document Supply service in the coming months why not register now so that you are all set up ready to start receiving documents? Please note you will need to create an On Demand account even if you already hold a British Library Reader pass. Click here to register now. We’ll send full instructions for to register and download your items when we send your documents. Article requests fulfilled before 1st September will continue to use the File Open system but we’re looking forward to saying so long to plugins and hello to this new, simplified, copyright compliant service. This entry was posted in Research and tagged British Library, document supply, e-resources, improvements, inter-library loans on 10th Aug, 2015 by reg206. A great way to prepare for your exams is to have a look at some of the past exam papers for each of your modules. These can give you a flavour of the tone of the questions and the sort of topics you are likely to encounter. Did you know past papers are readily accessible online? 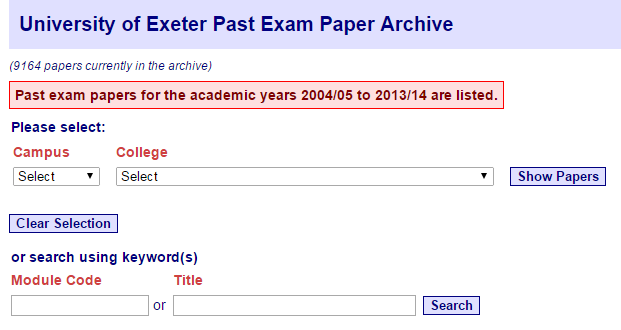 There are currently over 9,000 past papers available for you to view in the University of Exeter Past Exam Paper Archive: click here to access it (you will need to authenticate with your usual university username and password). Once you’ve logged in, you can search the archive by college, module code or title keyword. Papers can then be viewed as PDFs. This entry was posted in E-Resources and tagged e-resources, exams, how to guides on 6th Apr, 2015 by reg206. Even more resources! Thinking beyond your subject. Anyone doing research needs to find the best range of sources of information. We all get used to using the main journals, databases and resources for our own subject. Increasingly, though, we choose projects which cross over into other subject areas – cosmetic surgery marketing might combine sociology, health and marketing topics, while children’s attitudes to money could include psychology, education and economics. Programmes such as Grand challenges can take you even further into interdisciplinary areas, as you work with colleagues from across the University to address real-life issues. So where can you look for additional sources? Google will help you find useful information, but you may discover that we don’t have access to the full text. To save time you could explore what’s available via Exeter’s subscriptions on the Electronic Library. As an example, let’s look at Business resources – these often overlap with other subject areas including Geography, Psychology, Politics and Law. Two of the best general databases are Business Source Complete and ProQuest Business. Both have the full text of over 3,000 journals covering subjects relevant to Business Studies, along with news releases and reports. They are easy to use and anyone can log on via the Electronic Library – just select Business as the subject area and click on Find resources. Other more specialist databases cover company information, finance and market research. If you need help in finding out which databases to use have a look at the pages on Researching Business Online on our subject guide. This has details of all the main databases and includes links to online tutorials if you need help. Through the Electronic Library you have access to all of the Library’s resources – not just those aimed at your own courses. Why not explore, and see what else you can discover? This entry was posted in E-Resources, Information skills and tagged e-resources on 2nd Apr, 2015 by rmo204. Welcome to all our new students! We hope you’ve been enjoying Freshers’ week. Here are a few tips to help you on your way as you start getting to grips with your reading lists and with our extensive range of Library resources. Start using e-books and journals! The Library is so much more than the print resources you’ll find on our shelves. We also have a wide range of online books and journals and the beauty of these is that you can access from anywhere you have an internet connection. The Library Catalogue is the best route through which to access our e-resources. From the above view you just need to click on the title of the resource to view the full record and then click on the appropriate link to access the resource. Login with usual Exeter username and password and now you’re ready to read! We understand that you need to study in a flexible way, and we’re here to support that. This is why the Forum Library is accessible 24 hours a day: Library staff are available 08.00 – 20.00 on weekdays and 10.00 – 18.00 at the weekend but outside of these hours registered staff and students can still swipe in using your Unicards (see our website for full details plus the opening hours of other Library sites). To get the most out of our 24/7 facilities you’ll need to be familiar with our self-service borrow and return facilities. They’re easy to use and all located near the main Library entrance on Forum Level 0 – do check them out and then you can start checking out books, whenever you need them! Once you’ve logged in you’ll see a list of the items you have on loan, together with the date they’re due for return. You can choose to sort by due date, to see which items need to be returned or renewed soonest. To renew all of your items, click Renew All. If you only want to renew some of them, tick the boxes by the titles you want to renew and click Renew Selected. You’ll be asked to confirm you wish to renew these items. Click Yes to complete the process. The Status column should now clearly state ‘renewed’ and show the new due date. If any items cannot be renewed, a message will appear to warn you of this and the status column will show the reason why. Please note that you can’t renew your items online if they are more than 7 days overdue (7 hours for Express Collections items), or if you have unpaid fines of over £10. In these situations you’ll need to contact the Library in order to renew. Further questions? From borrower FAQs and details of the different study spaces available across campus, to research skills and information about your Subject Librarian , you’ll find loads of information on the Library website. Do please take a look. We wish you all fruitful reading and researching! This entry was posted in E-Resources, Forum Library and tagged 24/7, e-books, e-resources, Forum Library, freshers, how to guides, self-service on 18th Sep, 2014 by reg206. Each year we scrutinise the feedback from the NSS survey and use that information to direct our annual Library Resourcing Campaign. We want to make sure that we are providing even more of the resources that you need. During 2013/14 we are directing £298k to boost access to core materials: this is in addition to the millions spent on library resources across the Colleges. Packages provided include SAGE Research Methods Online, Literature Online and Ethnography Video Online. This funding has also provided access to over 9000 e-books this year. This entry was posted in E-Resources, Student-Led Resourcing and tagged books, e-books, e-resources, IWOOT, Library Champions, travel bursaries on 7th Feb, 2014 by cagale. Hearty congratulations from all of us in the Library to everyone who is graduating this week! We hope you enjoy your ceremony and well-deserved celebrations. Access to all University subscribed Sage Journals (in a variety of subjects), along with Sage Research Methods Online and Sage Knowledge Business & Management e-book collection. To access our alumni e-resources you will first need to register with the Alumni Office. Find out more on their alumni benefit webpages. 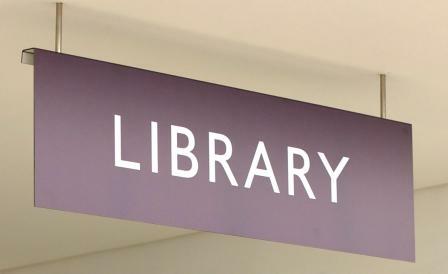 If you live locally you can also access many of the Library’s electronic resources via our walk-in PC facilities in the Forum Library and St Luke’s Library. Find more information here. As an Alumni you are also entitled to join the Library and borrow up to four items at a time from our print collections. A one-off registration fee of £35 applies for this service (except for PhD alumni who are entitled to join for free). To apply for alumni membership, or for more information on this scheme, please visit our website. So graduation is only the start of your lifelong learning journey, and we look forward to welcoming many of you back to The Forum Library, Research Commons and St Luke’s as alumni Library members! This entry was posted in E-Resources and tagged Alumni, borrowing, e-resources, how to guides on 15th Jul, 2013 by reg206.